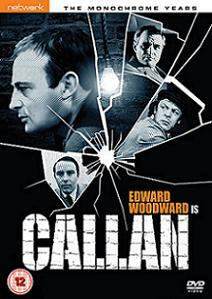 Originally airing on ITV in 1981, a decade after the final episode of the original series, and now debuting on DVD just 12 months after the release of the monochrome episodes, it’s hard to imagine Callan: Wet Job not being heavily anticipated by anyone who became addicted to the murky world of espionage inhabited by Edward Woodward’s tortured David Callan. Sadly, while the classic elements of double-crossing and uncertain morals, not to mention Woodward and Russell Hunter as Lonely, which made the 60s and 70s Callan’s so unmissable, are present in this TV movie, the overall feeling is that everybody involved was doing it out of duty rather than love. The lacklustre plot sees a retired Callan, now with a new identity and girlfriend, pressed back into duty by a new Hunter as the Russians rear their heads for a new bout of Cold War antics. Confused youths with misplaced loyalties get involved with ageing agents with old scores to settle, Callan left to ponder past glories as George Sewell adds a modicum of watchability to proceedings. The idea of returning to Callan after an extended break may not have been the wisest, but there were always going to be ways to do the character justice. Whether Callan had become a washed up clone of Lonely or a high-powered Government official, the dramatic possibilities were endless. For some reason what we got was an anaemic reunion that didn’t do anyone any favours. In its favour, Wet Job does feature Callan and Lonely together again, even if the friendship supposedly enjoyed by the pair in the past is perhaps over-stated. Woodward and Hunter bounce of each other like they’ve never been apart and one wonders if a simple 60-minute two-hander between the pair, two old men reminiscing about their lives, might have been yet another way to make this production more memorable. For anyone stumbling across this review who decides to sample the world of Callan for the first time, be aware that Wet Job isn’t representative of the parent series. For everything I’ve said above you can reverse the sentiment for the original, which I still maintain is one of Britain’s finest televisual moments (if you can count four exemplary seasons as a single moment). By all means watch Wet Job if you’ve already immersed yourself in the 60s version, but only then. That way you can put this quietly away on the shelf before picking up series one and starting all over again. Double O Section on Whodunnit? 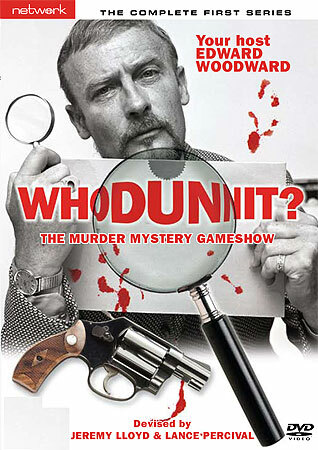 I mentioned a few days ago that I was looking forward to the release of Whodunnit? on DVD, a slightly obscure Edward Woodward gameshow from the 1970s. Now, one of my favourite blogs, Double O Section, has flagged the announcement as well, giving me a chance to plug both the series and the site. Devised by Lance Percival and Jeremy Lloyd, Whodunnit? features a number of well-known faces from British telly, including Frank Windsor and Woodward’s Callan co-star, Russell Hunter, solving series of mysteries each week. I’ll admit to not knowing anything more about it, but that simple premise is made much more appealing by the presence of Woodward and Hunter, so it’s on the must-buy list. As for Double O Section, it’s a fantastic site by the enigmatic Tanner which searches out some of the most obscure, and the best-known, spy novels, films, TV shows and soundtracks (and whatever else has a spy connection) and makes them sound like you should have known about them long before now. I’ve discovered some impressive titles (and spent a small fortune on merchandise) over the last few years thanks to Tanner’s reviews and recommend you bookmark it today. I’m a bit late with this news about the Network DVD sale as it’s been running for the last 24 hours or so, but the good news is that it’s on until midnight tomorrow, Sunday 8 August, so there’s still time to nab a bargain. As a (slightly obsessive) TV fan who mourns the loss of quality drama from UK screens, bar the odd Life on Mars or Being Human every few years, Network’s dedication to archive telly is to be applauded. This new sale finally brings a number of box sets and single volume series down to an affordable price for those who might want to dip their toe in classic (or is that “old”?) television. The real highlights in the sale for me are the two Callan sets, a series I discovered earlier this year and which I’ve been trying to spread the word about for the last few months. I’ve reviewed both The Monochrome Years and The Colour Years so won’t go into detail here, but the black and white Callans are really a must for any spy fans with even a passing interest in the genre: with dark, gritty and multilayered scripts, Edward Woodward and Russell Hunter are perfect foils for each other, while Anthony Valentine threatens to steal any scene he’s in. Perhaps best described as the “anti-Bond”, David Callan was for six years one of the more unique portrayals of the career spy on British television, an embittered man for whom bloodshed was to be avoided where possible and loyalty to Her Majesty was almost a thorn in his side. Professional killer Callan (Edward Woodward) stalks the shadows of British espionage in these remaining episodes from series one and two, including the atmospheric pilot, Magnum for Schneider. Sent on each mission-of-the-week by the mysterious Hunter and both helped and hindered by fellow spy Meares (Peter Bowles and Anthony Valentine), Callan is drawn into the sort of situations where a conscience is left at the door. Sadly, for Callan’s superiors at least, the assassin does think about what he’s doing, usually in a noir-style voiceover, his disgust at killing leading to most plots spinning off into unseen directions as he carries out his own private investigations. Callan’s only “friend” is professional thief Lonely (Russell Hunter), so-called because his personal hygiene leaves much to be desired. Whereas Bond has Q and his never ending supply of gadgets, Callan has Lonely and the odd stolen gun and ammunition: glamorous this ain’t. Clad in dark suit and trenchcoat, spouting a series of sardonic put-downs and a tendency to call people “mate”, Callan is a very British spy, more likely to be found lurking in a back alley on the trail of a Russian spy than in the tropical climes so beloved of other series. The result is a complex series of misadventures the like of which hasn’t been seen before or since on television, Woodward’s layered performance a world away from his contemporaries such as The Avengers suave John Steed or self -assured John Drake in the globetrotting Danger Man. Episodes such as You Should Have Got Here Sooner, the finale of series one, highlight the elements that made the programme unique, with violence and double-crossing between colleagues showing both Callan’s ruthlessness and his loyalty to Lonely, even if he himself threatens him more than once. With the Cold War never far from the streets of London, even if we rarely see outside the offices and homes of Callan’s victims, the series is always tense, though there are enough touches of humour present to ensure our “hero” remains vaguely believable. A crucial part of the spy genre, coming to DVD for the first time anywhere in the world, this set represents a momentous moment in the world of TV on DVD releases and deserves evaluation – and enjoyment – from a new generation of fans.